Complete the task you've been meaning to do for ages. Historical figures like Herodotus, Leonardo Da Vinci, Pablo Picasso, Benjamin Franklin, Eleanor Roosevelt, and hundreds of others have talked about how procrastination is the enemy of results. 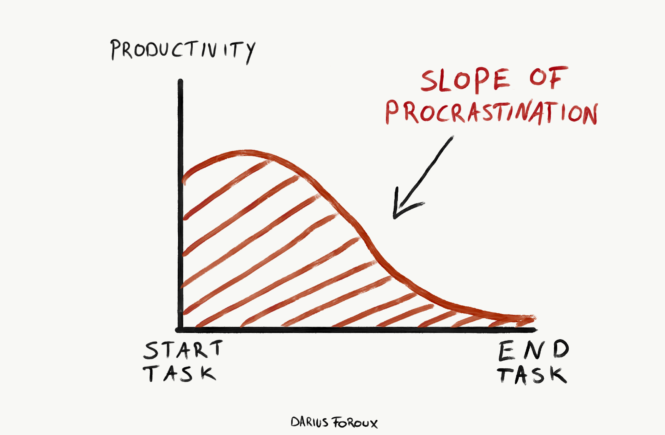 The funny thing about procrastination is that we all know that it’s harmful. Who actually likes to procrastinate? No one enjoys doing that. Me neither. In the beginning of each semester, I was the coolest mofo on the planet. Relaxing, going out, enjoying myself. Big time. I experienced no stress whatsoever. However, about a week before my exams, I would freak the f***k out. “Dude, why didn’t you begin earlier?” I would tell myself. And what would follow is an ugly sight of me, with a bunch of Red Bull cans, locked up in my room — freaking out while I was studying. And research shows exactly that: When you procrastinate, you might feel better on the short-term, but you will suffer in the long-term. It doesn’t really matter why you procrastinate. Some love the pressure of deadlines. Some are afraid to fail so they put it off until the very last moment. One thing that all procrastinators have in common is that procrastination has a price. Procrastination is not innocent behavior. It’s a sign of poor self-regulation. Researchers even compare procrastination to alcohol and drug abuse. It’s some serious sh*t. And I’ve experienced that for many years. The years after I got out of college were also a struggle in terms of starting and finishing work. Procrastination is a habit that just sneaks into your system. Every time I had an idea or a goal, I would start, but along the way, things would go wrong. I went from start to total chaos. Distractions, other ideas, other opportunities, failure, negative self-talk, etc, would get in the way. And the results are always the same: You never get anything done. In our minds, we’re all geniuses and mentally strong. But when the work comes, we cop out. If you’re a procrastinator, you can’t help but delay work. And that’s true for the small and big tasks. Sure, everybody fears to step outside of their comfort zone — that’s why we call them comfort zones. It takes courage to make a bold move. But it sure doesn’t take any courage to complete small tasks like paying bills, printing out something for your boss, doing taxes, etc. The truth is: Procrastination has nothing to do with what you’re trying to do — small or big, it can wait until later. It can always wait, right? There comes a moment between the start and end of a task—I call it the slope of procrastination—when you give into one distraction. And that’s exactly the moment you give up being productive. You start working on a task, you’re excited, you’re focused, but then, after some time, you think: Let’s read the news for a second. It always starts with just one thing. Then, you think: I might as well watch one episode of Game Of Thrones. Then, a video on YouTube—and then another one. Then, a little bit of Instagram browsing. And so forth. Willpower Doesn’t Work. Systems Do. I’m sorry to disappoint you: Freedom is your enemy. The fact is that, if you want to get things done, you need rules. What are some things that research proved to be effective? Accountability systems (commitment with friends, or a coach). Exercising 30 minutes a day. And most importantly: Internal motivation. If you combine the right productivity tactics, you have a productivity system. The deadlines create urgency, accountability will create responsibility, working in intervals improves your focus, exercising will give you more energy, so does a healthy diet, and eliminating distractions will take away the temptations. But there’s no system that can help you if you don’t have an inner drive. People overcomplicate that concept, but it’s simple: Why do you do what you do? If you don’t know. Make something up. If you know why you’re doing something, even the most annoying tasks become bearable. It will become a part of the bigger picture. So, instead of diving into work, take a step back, think about why you do what you do, and then rely on a system supports that. Not rocket science. Just science. Are you an auditory learner? Listen to my latest podcast episode, in which I share more tips about overcoming procrastination. Join 26,879 other readers who get my newsletter. I’ll also send you my eBook ‘How To Go From Procrastinate Hero To Procrastinate Zero’ for free.